I Think Everybody Could Use Some Soup -- Bead Soup! 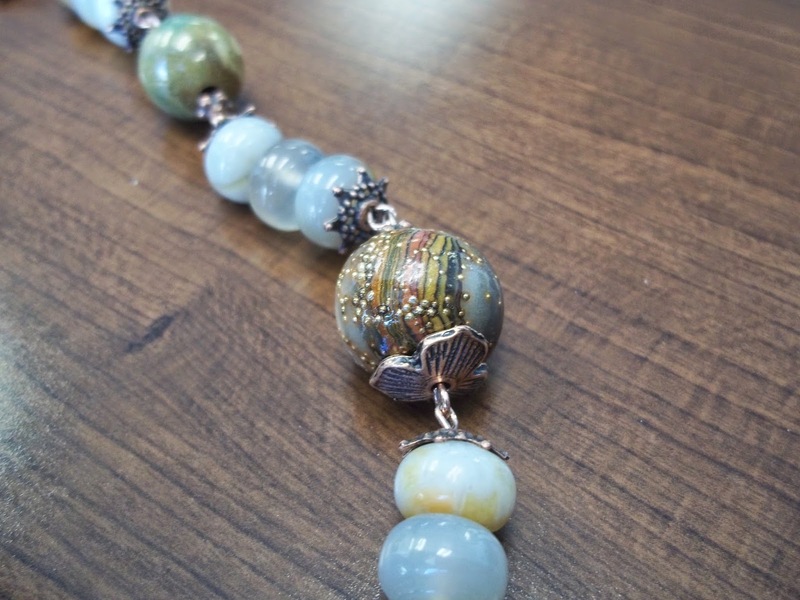 I can't believe that this is my sixth year participating in Lori Anderson's Bead Soup Blog Party. In a nut shell, just in case you are brand new to my blog, what this exciting project is about is getting many, many jewelry designs together to swap beads (the soup ingredients, which must contain a focal and a clasp as well as a few coordinating beads) and then design with the beads that you receive from your partner. After a period of time, all the participants post pictures of their creations on their blogs -- the big reveal! It's amazing that Lori can do all of this. She is the hostess of this event, while dealing with health issues, being a mom and wife and running her own small business. We all, both participants and viewers, owe Lori a slice of pie (at the very least) for all that she does for the jewelry design community. Go visit her shops and show her some love, she deserves it! On to the big reveal. My partner this round, the 8th, is Sam Siegel of Sam's Bead Shop. Sam runs an amazing online bead store. Boy did I get lucky! First, I get paired with one of the few male participants, then it's someone who is very generous with his merchandise. And what beautiful beads and findings. Look for yourself. Aren't they amazing. I'm really not sure what anything is, except, I'm pretty sure that the focal is crazy lace agate. Oh well, all I know is that everything is gorgeous! 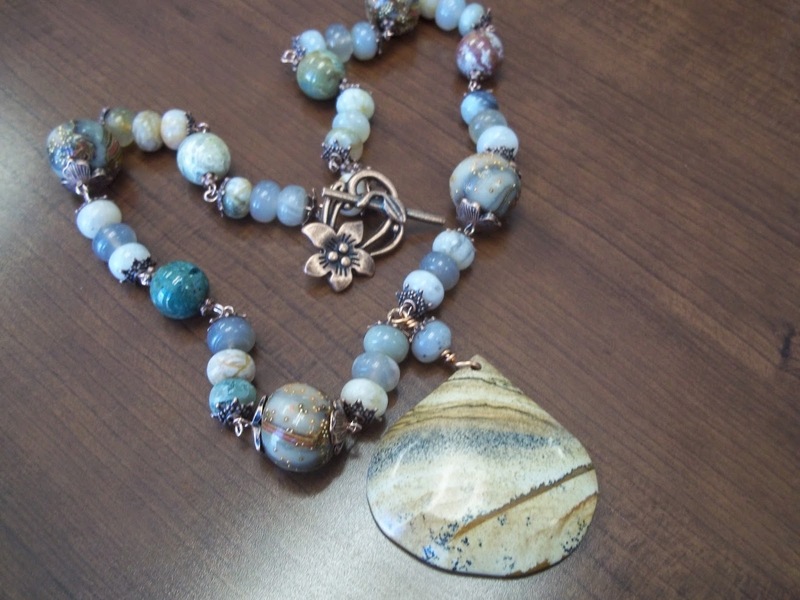 The clasp and beadcaps that were in the mix are beautiful antiqued copper. Just lovely! At first I wasn't sure if I was going to be able to make the reveal deadline because during the same timeframe as the party, I had two different procedures done to my back and hip and, well ... let's just say that I wasn't up to designing. Just as I had written to Sam explaining why I wouldn't make the date, I took out the beautiful stones again and the idea for the necklace popped into my head. I got out the wire and the pliers and went to work. Look how amazing my polymer beads went with the stones that Sam sent. AMAZING! I can picture this piece on one of the women in Downton Abbey. 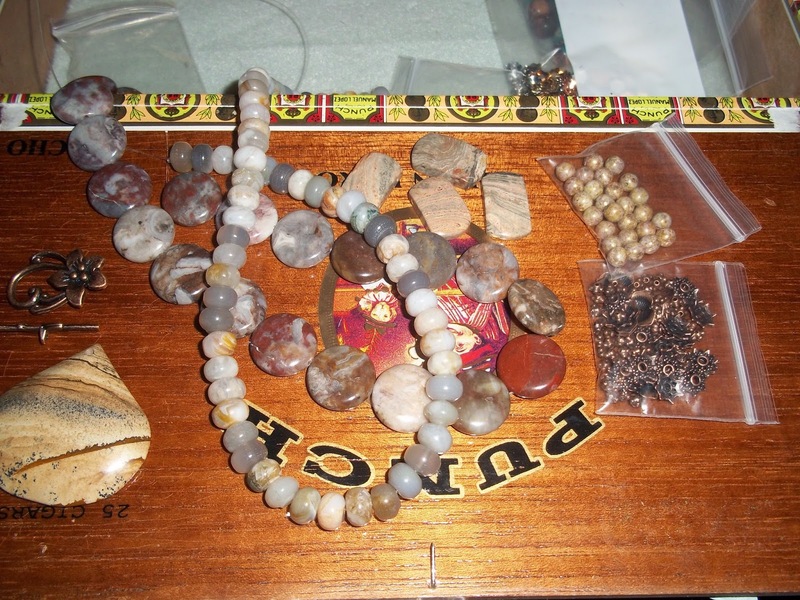 Seriously, I can't believe how wonderful my beads blend so beautifully with these stones. 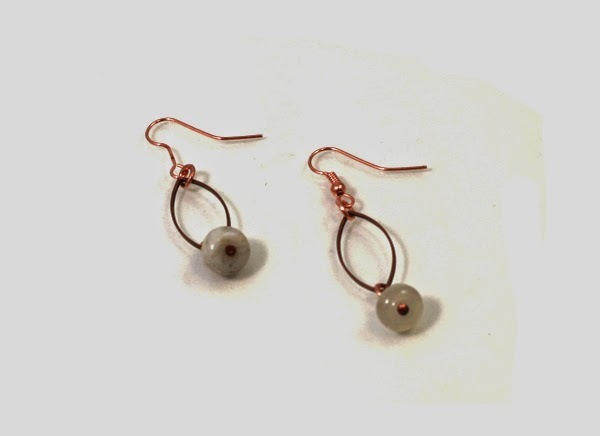 I had some copper links on hand and wired together these earrings. This picture doesn't really show it, but the beads that are dangling there are the same rondelles from the soup that Sam sent. I used the same links and rondelles in the bracelet. I added some larger round beads that I had in my stash and used them with the coins that Sam sent. I wired 12 little dangles to the chain and finished it with a simple copper toggle that I had. 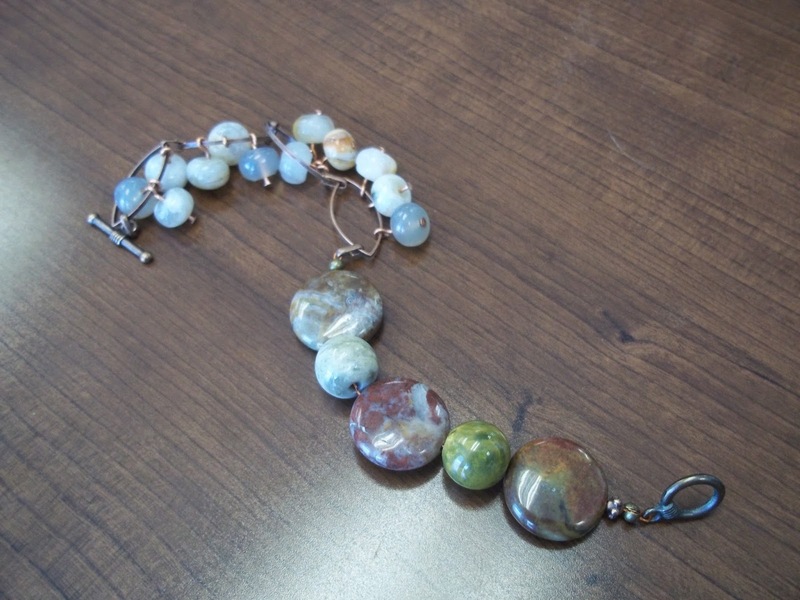 This bracelet is fun and modern compared to the necklace, but I think all three pieces look lovely together. 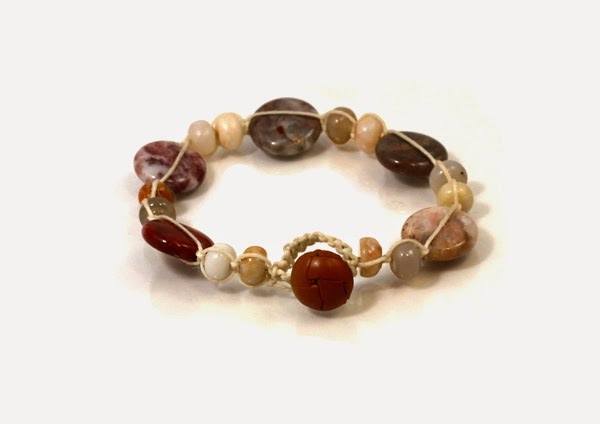 I also used the rondelles and coins to create this macrame bangle. The clasp is an antique leather button that I have had forever. I knotted around some 20 gauge wire so that this wears like a bangle and to give the bracelet some stability on the wrist. Well, that's it, I hope that you enjoy my pieces and have fun at this year's party. Don't forget to visit the other designer's blogs and support us when you can. For information on purchasing any of the pieces you see here on my blog, just drop me an email, I would love to hear from you. 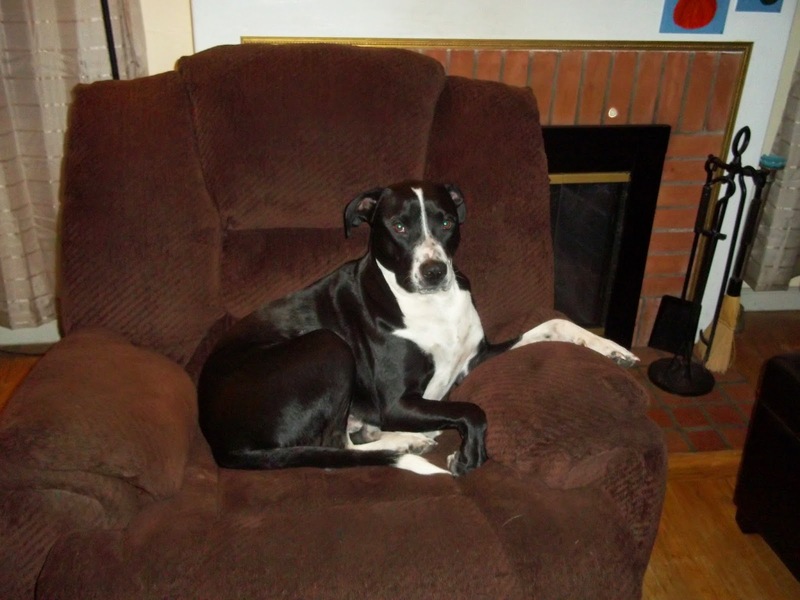 I will leave you with a picture of my sweet pup, Bosco, who enjoys watching television from my chair. He thinks he is a tiny, little lap dog. I better go join him. Who could say "no" to that face? Certainly not I.